Former NCWG Cadet named 2017 Army Soldier of the Year! 11/20/2017–HILLSBOROUGH, NC–Congratulations to former Civil Air Patrol (CAP) C/2d Lt Hazen David Ham for winning the U.S. Army's 2017 Best Warrior Competition. Army SPC Ham is from Hillsborough, NC and served in the Orange County Composite Squadron from 2011 to 2015. SPC Ham, 21, outperformed 22 other soldiers in weeks of grueling fitness challenges, written exams and warfare simulations in the Army’s annual Best Warrior Competition to capture Soldier of the Year honors. U.S. Army Pacific's SPC Ham was officially named the Army's Soldier of the Year during an awards luncheon at the Association of the U.S. Army's Annual Meeting and Exposition in Washington, D.C. The 2017 Best Warrior Competition had 22 competitors who won lower-level competitions at 11 major commands before they moved up to the Army-level contest. In the final competition, they faced grueling days of difficult tasks that challenged them both mentally and physically. "The group of soldiers here is one of the finest I've ever trained and worked with," said Ham, 21, who is an infantryman with the 25th Infantry Division's 3rd Brigade Combat Team. "It was a pleasure to see how they performed and, honestly, I didn't think I had won because they are that good." His leadership skills were also tested under pressure. "They really evaluated you on your ability to adapt as a leader and your ability to thrive in chaos," he said. 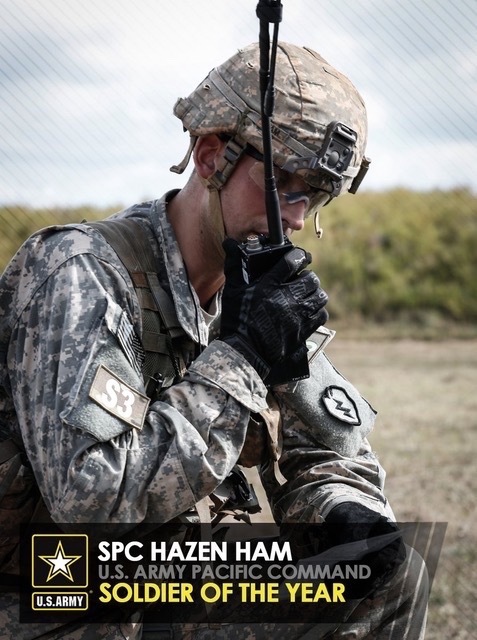 SPC Ham credits CAP with helping him win the highly-competitive competition. “CAP helped me by getting me somewhat familiar with military structure and discipline as well as operating with a chain of command. The skills I was able to develop in the Cadet Program have proven invaluable already in the Army. Public speaking and instruction, radio usage, attention to detail, time-management, and an understanding of leadership principles are major assets in my current job. It is fair to say that without CAP, I would have been less likely to win Army Soldier of the Year." Two of SPC Ham’s siblings are also involved in CAP. His next-youngest brother, Daniel Ham, is the former Cadet Commander of NC-150 and his next-youngest sister, C/2d Lt Abigail Ham, is the current Cadet Commander of NC-150.